After paging through Small Trades, Irving Penn’s portrait series depicting skilled trades people in their work clothes, New York-based fashion photographer Gregory Kramer had an epiphany. “I woke up one morning and was like – that’s it! Let’s document the New York drag scene,” he recalls. Kramer was inspired by the classic studio photography that Penn had mastered in the early 1950s: a full-length figure set before neutral background and softly lit with gentle lighting. Each subject was portrayed with elegance and dignity so that viewers could see the person who lay beneath the uniforms they wear. This approach resonated with Kramer who understood: underneath the wigs, the make-up, and the costumes are innovative and creative performers greater than the sum of their parts: they are groundbreaking figures whose commitment to the craft of drag has redefined the art. Kramer called the person he knew best: Linda Simpson, a fixture on New York’s drag scene since the 1980s. Simpson was Kramer’s first subject and his entrée to the scene. 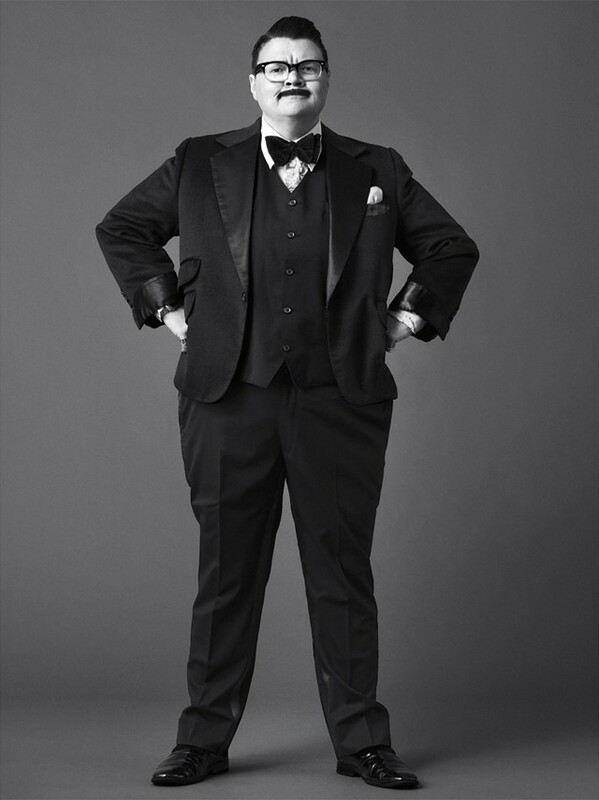 Over the next year, Kramer went to work, creating a series of portraits of legends including Charles Busch, Lady Bunny, Duelling Bankheads, Sherry Vine, Flotilla DeBarge, and Tobell Von Cartier. He also made a foray into the Brooklyn scene, photographing the drags who continue to push the envelope, including cover girl Sasha Velour, winner of the latest season of RuPaul’s Drag Race. The result is Drags (KMW Studio), a sumptuous monograph with 80s black and white portraits that will leave you breathless as you take in the full glamour and glory of New York’s finest. As a way to give back to the city that he loves, Kramer is donating his author royalties to the Ali Forney Center, which assists and protects homeless LGBTQ youth. Kramer speaks with us about his experiences making a book with the city’s groundbreaking drags. How did you select the drags featured in the book? Gregory Kramer: When I began, I only knew Linda Simpson on a personal level so I reached out to her and she was game. She’s a little bit older and known as the Drag Mother to a lot of the younger kids in the scene. I had a list of 17 people I wanted to initially photograph, and Linda introduced me to them via email. Out of that 17, nine people ended up in the book. The others were not in New York, uninterested, or too demanding. From there it grew organically. I would shoot someone and they would recommend their colleague. I was pretty familiar with the Manhattan scene, but the Brooklyn scene not so much. Merrie Cherry, who is the Mother of the Brooklyn Drag scene, provided me with a list of eight people including Sasha Velour, Aja, and Raggamuffin. Towards the end of the project, I felt like I needed more people so I went on Facebook and looked at friends of friends. That’s how I found Wang Newton. What was the portrait session process like? Gregory Kramer: Almost every session started off with a text or an email saying that they were running late. Drag time really does exist. They would arrive in various states of drag. They would either arrive camera ready or they would come with their face on and do their hair and dress. During that time, it was great. We’d sit there and chat, and they would fill me in on their life. We would discuss how they wanted to be photographed. We would shoot a few frames, then sit down and tweak hair, make up, and styling – whatever needed to be tweaked. Then we would go and shoot anywhere from 60 to 100 frames, then sit down and edit the photos together. Every picture in the book was approved by both myself and the performers. Please talk about the Ali Forney Center and why you chose to donate your author royalties to it. Gregory Kramer: I moved to New York City from a small town in Michigan, have had a successful career, and felt it was time to give back to the community. Linda introduced me to Ali Forney Center and their amazing work getting LGBTQ youth off the streets, empowering them with the tools they need to live independently. Everyone who came into the studio knew it would be a benefit for AFC. That was planned from the start. Singer and actress Peppermint got her start performing the Tunnel, a New York City nightclub, and went on to become a fixture on the city’s nightlife scene. In 2010, she was featured on Queens of Drag: NYC, a web series running on gay.com – before hitting the big time earlier this year on RuPaul’s Drag Race, where she finished in second place after Sasha Velour. While other trans women have appeared on the show, Peppermint was the first to be out prior to airing. Gregory Kramer: “Flloyd is complete insanity – but in the best way possible. Flloyd’s been a fixture on the scene since the 1980s. He was part of the Lady Bunny, Ru Paul, Linda Simpson Pyramid Club scene. Flloyd: “As a child, I was obsessed with the Surrealists. My first concept of drag was a birdcage on my head filled with live snails. Later I loved the absurd drag of Monty Python. When I discovered Leigh Bowery, I thought he was an amazing blend of the two. I try to blend these with other heroes such as Alice Cooper and KISS. I always wanted to be the Gene Simmons of drag. Gregory Kramer: “Marti does it all. She’s a singer. She hosts some of the most notorious drag spectaculars in the city. She’s also done Off-Broadway theater, national tours, and red carpet interviews with celebrities. Gregory Kramer: “Crimson Kitty is New York City’s premier female drag queen. She has raised the question, ‘Can a female be a drag queen?’ Drag is traditionally based in men dressing up as women and women dressing up as men – but there has been a whole new movement within the drag community, especially in the Brooklyn scene, that has allowed anyone to do drag, whoever you are. Hailing from Taipei, Wang Newton started his act as a “life of the party” performer, making his official debut in full drag on Halloween Night 2004 in Philadelphia. Wang fully embraced the lounge lizard persona and took it to the clubs, hosting everything from karaoke nights to the Hellcat Girls’ Burlesque. Wang currently lives in New York, where he runs Wang TV on YouTube, which features everything from Drag King to interviews with the likes of Coco Rocha. Sugga Pie Koko proves that genuine talent is key if you want to make it in this world – well that and charisma, uniqueness, and nerve. She started her act after a drag pageant didn’t go as planned; when the plus-sized lovely stepped on stage, people laughed. But Sugga has the last laugh with a career that spans nearly two decades, with unforgettable performances in nightclubs and private events all around New York City. Kim Ono: “My style is an unlikely blend of ethereal, avant-garde, and classic, with handmade garments featuring bold symmetry and exaggerated reveals. It’s a visual representation of her persona – polished, regal, and professional.